Jim Loewer's lustrous bowl symbolizes enduring love in all its varieties. There are two sides to being in love. There's the thrilling, bubbling whirl of feelings that pulse in your chest, and then there's the vulnerable sensation of placing your heart in someone else's hands. 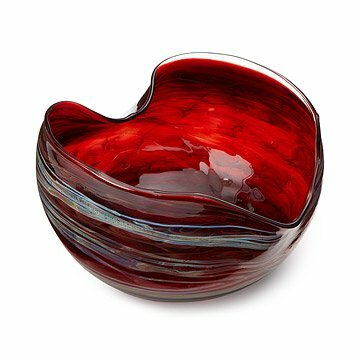 Artist Jim Loewer captures both ends of this spectrum in his colorful, glass heart bowl. The hand-blown glass churns with a passionate rush of color that circles around the outside. And Loewer uses an ancient technique called lampworking to form the rim into an open heart. In lampworking (as in love) the heart's true form is created as the raw material is warmed over a flame, becoming soft to the touch. Whether as a commemoration of a new romance or a time-tested partnership, this work of art will be a treasured memento of enduring love in all its varieties. Handmade in Philadelphia. Glass artist Jim Loewer is inspired by Flaubert's ironic definition of art: "of all lies, art is the least untrue." But this much is true: his glass blowing is primarily self taught through a process of trial and error, and he loves the relatively instant gratification that comes with the process. A bit of a renaissance man, Jim has an undergraduate degree in painting, a teaching degree, and a law degree he obtained studying at night while making glass by day. Jim focuses on contemporary organic forms influenced by Japanese craft and the American studio glass movement. This was a gift, a perfect gift! The reason I bought this was for its simple beauty. It functions first as a joy to see, and second as a holder of tasty treats. Was as expected, true to picture. I loved giving such a special and unusual gift. This is the reason you shop here. Unique products. Display for dinners, and everyday showing. We will be returning this item. This is absolutely breathtaking! I can not wait to have it!! Very carefully and only at special occasions. I purchased this for my besties birthday and she loved it! This is the worst product I have ever purchased from this website. If it had been the first one, I would never consider buying another item from you.